The Glen Lake MI region is known for its picturesque beauty, rolling, wooded areas, and the clear indigo blue waters. Considered one of the most beautiful areas of the great lakes, it is situated in Leelaneau County, and has two bodies of water, the Big Glen Lake to the east, and the Little Glen Lake to the West. It’s also a popular destination for boating, fishing, swimming, walking and running the many trails in the region. A popular vacation spot, with quaint villages, such as Glen Arbor, and Glen Haven, offering vacation homes, popular dining, music, boat skiing, kayaking, and other summer sports, Glen Lake offers the perfect getaway. Little Glen Lake is perfect for shallow water fishing and swimming, with a depth of 12 feet, and Big Glen Lake at 130 feet. Fishermen can catch yellow perch, smallmouth bass, brown trout, lake trout, and northern pike. It is also known for driving tours, weddings, Sleeping Bear Dunes National Lakeshore, resorts, dunes, meadows, lush forests, and summer cottages. Nature enthusiasts will also find the nearby Sleeping Bear Dunes National Park an excellent place to investigate nature, bird watch, canoe, and capture exquisite photos of wildlife in action. 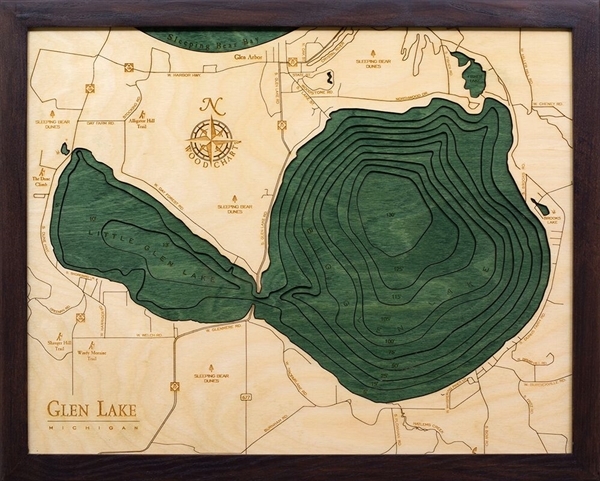 https://www.carvedlakeart.com/san-diego-wood-nautical-chart-map-p/sdgo-d3l.htm Check out carvedlakeart if you want the best deals on laser cut map, wood nautical chart in Glen Lake MI, wood topographical map, and charts of the lakes, streams and oceans of the world. There are also many events throughout the year, such as the Spring tour of the natural cherry and orchard, and wild flower blossoms. Capturing blossoms on camera also brings the birth of nature alive. The week leading up to Mother’s Day is also Restaurant Week. Summer brings Solstice and Half Marathon 5K Race, the BBQ and Brew Festival, the Manitou Music Festival, and many other events. Fall is also a beautiful time of year in the area, with color tours as leaves are changing to beautiful hues of the sunset, and breathtaking kayak trips that allow for reflections on the water. Winter brings free ice skating, hockey, and holiday lights. Winter sports include cross country skiing, downhill skiing, and ice fishing. Other events throughout the year are winery tours, charter fishing, museums, and local restaurants, such as Art’s Tavern. The tavern, in existence since 1934, offers visitors the best food, beer, and cocktails in the region. Recognized as Michigan’s original gathering place, it’s locally owned and operated, and has served locals, tourists, and vacationers for generations. Visitors can expect the best smoked trout, steaks, and signature dishes and sandwiches in the area. One thing visitors won’t find in the Glen Lake area is chain restaurants. Glen Arbor and the surrounding area pride itself on locally owned specialty restaurants, shops and boutiques. In addition to some of the best food in the area, visitors will also find one-of-a-kind shops, friendly clerks, and perfect items for individual needs. In addition, those planning the perfect vacation spot will find the best real estate, vacation homes, cottages, and resorts in the country by viewing Glen Lake maps. And though the Glen Lake MI area was named the most beautiful place in America, the average price for real estate is still relatively low. For instance, average prices for waterfront real estate, is $352,714, with the average listing price per square foot at $267. Many local real estate and rental companies also have diverse listings for the more than hundreds, or thousands of cottages and rental homes they manage. They often fit individual needs, and type of vacation with the perfect home, cottage or cabin. Companies can also match individuals with their perfect dream home, if in the market to purchase. Rentals can also sometimes be secured for half the price many people would spend for a week on fees at a hotel. Staying in a home is also much more comfortable, and convenient, and gives access to beachfront privacy or local sports and vacation itineraries in a way hotels don’t. No matter what type of housing selected, visitors to the Glen Arbor area can find the perfect home, cabin or resort to compliment their vacation itinerary.